Te-Iltcohe Truebless Susanna 2014 Heart of the Ozarks Dairy Goat Show Sr. Grand Champion Alpine Doe. Shown on the left is Te-Iltcohe Truebless Susanna AA1549381 as a dry yearling at the 2011 Heart of the Ozarks Dairy Goat Show where she placed third. Susanna is sired by Mamm-Key Gent's Trueblood AA1458526 and out of PEARL VALLEY PRODIG BLESSING AA1386377. 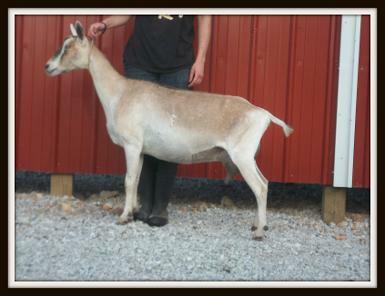 We are also excited by Susanna's recent 2nd place in the 4 year old Alpine doe class at the 2014 Missouri State Fair. To the right is Te-Iltcohe Enter Silmarien AA1794458 a 2016 Susanna daughter sired by Shining-Moon Xrated Enterprize . She was first place 2 yr old doe at the 2018 Heart of the Ozarks Dairy Goat Show. Te-Iltcohe Hilarious Fiodadh (3-25-15) began her show season with a Reserve Jr. Champion Alpine placing at the Tri-County Fair. 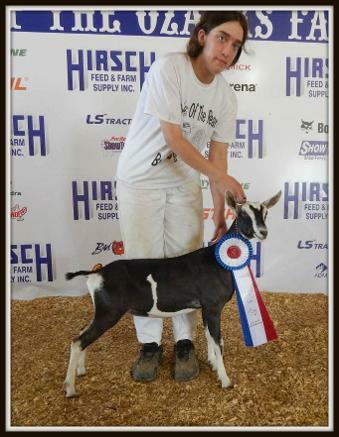 She then went on to take Grand Champion Jr. Alpine doe honors at the 2015 Heart of the Ozarks Dairy Goat Show, Jr. Grand Champion in ring two of the 2015 Quad Show, Springfield Mo., and second place Jr. Alpine doe at the 2015 Tulsa State Fair.. She is sired by Sequoia Wood CC Sabathia and is the grand daughter of Te-Iltcohe Joyous Lalaith (also pictured on this page). 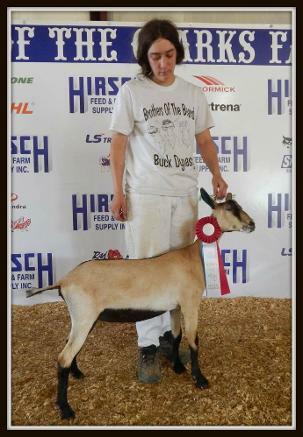 Fiodadh's herd mate, Te-Iltcohe Faithsprize Yavanna (3-2-15), took the Reserve Jr. Champion Alpine Doe honors at the 2015 Heart of the Ozarks Dairy goat Show. We have confidence that this lovely Shining-Moon Xrated Enterprize doe kid out of Waiilatpu HSAP Keep the Faith will continue to show well for us in the coming future. 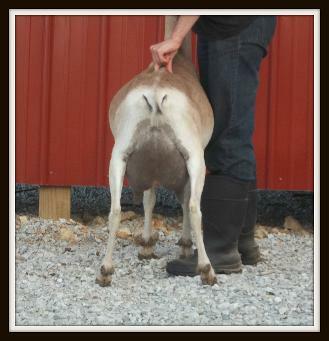 Photos courtesy of the Heart of the Ozarks Dairy Goat Association. Then and now....Te-Iltcohe Hilarious Fiodadh in her working clothes shown here with 12 hours of milk and 18 months since freshening. Just a few of our 2018 "Show Girls". Te-Iltcohe A Legacy Of Patty GA1799909 is a 2016 Iron-Rod Staubach Sir Legacy daughter. first place 2 year old recorded grade doe at the 2018 Missouri State Fair. Te-Iltcohe Glitters Galadriel AA1682377 a maternal grand- daughter of Mamm-Key Sedona's Bogy. Te-Iltcohe Zin-Prize Mow A001734702 another lovey Enterprize daughter. Some of our favorite and best foundation does came from the Sarah B's Alpine herd and I would like to share this fine herd's contact information with those of you interested in good quality and productive Alpines for show or work. www.shepherdsgate.net. This herd is also where our entire foundation herd of Lamanchas originated. Thank you Coraleen and Mark Bunner of Pfeifer, Ks. for making available to us great goats like Netty and Splat.